I think most music appreciators have a handful of bands or artists that totally reprogrammed their perception of music. I remember the first time I had listened to Radiohead. In fifth grade, my mom had begun noticing that I was kind of a weird kid, so she gave me two CDs she thought I might like: Kid A and OK Computer, which were given to her by one of her best friends, a photographer and painter named Yelena Yemchuck, who dated Billy Corgan around the turn of the millennium. I stuck the CDs in my disk drive, one after the other, and dragged the albums into iTunes. Which album I listened to first, I can’t say by memory, but I was enamored by both from the get-go. I indulged myself with OK Computer’s 5th-dimensional-rock and satiated myself with Kid A’s technomorphous dreamscapes. “Idioteque” and “Morning Bell” taught a 10-year-old how to dissociate from reality. I shared my discovery with my friends; a couple were mind-blown, but most of them didn’t understand. Today, Radiohead holds the longest-standing consistency of my fondness for a band. Last night, at Franklin Music Hall, I saw their lead singer and main songwriter, Thom Yorke for the first time. He’s currently on tour in support of the soundtrack he wrote for the new remake of Suspiria. I must admit that, for the first couple songs, I was beginning to think the entire show was going to be a snooze-fest. There’s only so much bleep-bloop yuppie minimalism I can handle, and I was grateful to Tarik Barri’s brilliant visual projections for holding my attention. Barri stood behind two computer monitors stage stage left, where he manipulated the projections in real-time. They were some of the most beautiful and artfully crafted I had ever seen, and turned what would have solely been a musical experience into a multisensory art installation. At stage-right stood Nigel Godrich, Radiohead’s longtime producer, on bass and electronics. 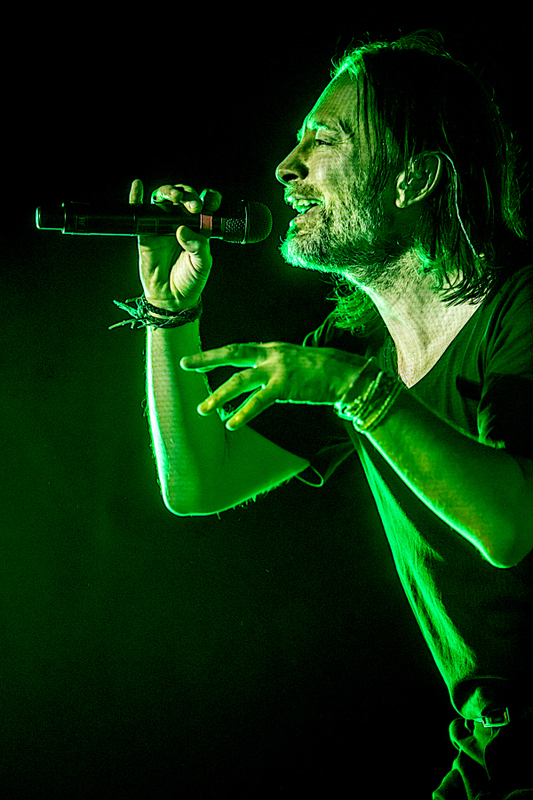 Thom, on vocals, of course, dabbled in some sound manipulation, sat down a few times at the piano, and sometimes picked up a Jazzmaster running through an AC30 – a classic combination – for some super-delayed riffs that melded into cascading ribbons of singing strings long after he had put the guitar down. “Impossible Knots” was the third song, which marked an acceleration point in the show for me, the beginning of the rising action. It was followed by “Black Swan,” perhaps the most Radiohead-like song from Thom Yorke’s solo project. They played “Amok,” a song by Thom Yorke’s other project, Atoms for Peace, and one of the best songs of the night. The set closed and climaxed with a with a 12-minute “Traffic” followed by a 7-minute “Twist.” The first encore featured the first American performance of “The Axe,” followed by “Atoms for Peace,” which flowed into “Default,” basically the same song, except it’s off of Atoms for Peace’s Amok (2013). The crowd, though thoroughly satisfied, would not accept just one encore, and so we all waited until Thom came back out alone to sit at the piano. He played a live debut of “Unmade,” from the Suspiria soundtrack. This entry was posted on Saturday, November 24th, 2018	at 5:56 pm	and is filed under News	. Responses are currently closed, but you can trackback from your own site.